Happy New Year! Here is another update on the Total Nuclear Annihilation project. 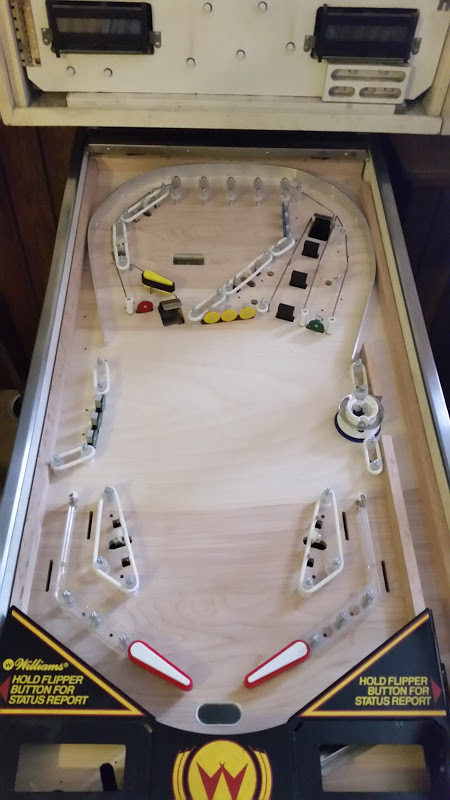 I have currently finished populating and testing the layout of the V2 playfield. The next step will be to finish the design of the V3 playfield that includes inserts. I also need to update my trough cuts to adapt to the new Pinball Life ball trough that will be coming out early this year. I will post some specs of that trough once I get it into my design. Below are pictures of the populated V2 playfield, a video of my inline drop ball locking release, and a sneak peek at an early version of the V3 playfield that includes inserts. Click on the images for the full size view. LIONMAN be with you all! Love the design and the updates, Scott! I think the multi-drop target design will be a lot more reliable in the long run than what was in the first revision. Thanks Jimmy! I agree completely. Hi Scott, I want to do a DIY Pinball, too. I wonder if you bought the wires guides or did them on your own and which screws you used for all the parts. The wire guides are just forced into small holes, right? The wire guides are stainless steel rod stock that I bent. You can do it with a pair of vice grips. This rod stock is usually available at any hardware store. I used 1/8 inch diameter. Yes, these are just forced into 1/8 inch holes int he playfield.